What a gorgeous day we had in MA today! The comfy temps and the bright sunshine made it a perfect day to visit Old Sturbridge Village in Sturbridge, MA. Admission to this outdoor (1830's era) living history museum with original buildings was free courtesy of the Highland Street Foundation. Today was the last Friday of FREE FUN FRIDAYS 2011 sponsored by this generous foundation. Families enjoyed their visit and everyone learned while having fun! What a great place to visit and the large number of visitors all lived in another century for the day! It has been a day filled with fun! Tomorrow, we will finish preparing for Irene who will be visiting us in MA on Sunday. Tomorrow, lawn chairs and planters will be stored and drains cleaned. Yes, staple foods have already been purchased and we'll hunker down. 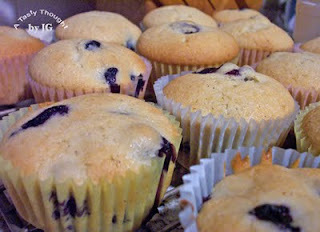 A couple of weeks ago I had baked Yummy Blueberry Muffins. One batch yields 22 muffins. Sometimes, there is enough batter for that one extra muffin. :) These muffins are delicious and also freeze very well, so some were stored in our freezer for another day. Sunday will be that day! 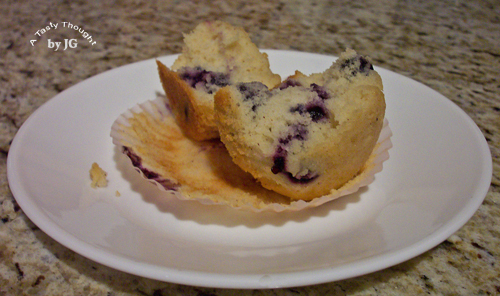 Tomorrow the last remaining 6 pack of Yummy Blueberry Muffins will defrosted. WooHoo! It's always wonderful to reach into the freezer and locate a bag of these delicious muffins filled with Blueberries! Do you freeze muffins to enjoy later? Stay safe this weekend, my Friends! The hard bound red Treasured Polish Recipes For Americans cookbook is located in my large collection of cookbooks. It's a cherished gift that I received in 1973. In this red cookbook are many delicious recipes that my fam has enjoyed. My notes on the Babka include "excellent". It requires two risings and five egg yolks, so I haven't baked it in a few years. Last week we had purchased two cucumbers at a local roadside stand and they had found a home in the veggie bin in our fridge. Now in this cookbook is a recipe for Cucumber Salad. My sons were not fond of this type of salad, so I haven't prepared it in a number of years. Time marches on... Guess what delicious salad was prepared one night this past week? My DH & I enjoyed it! Thinly sliced fresh cucumber pieces were covered with sour cream (fat free) that contained bits of fresh chives, a little salt and a bit of sugar. I used less salt & sugar. Yes, there are specific directions, but it is a tasty crunchy salad! Cut into very thin slices. Place very thin cucumber slices in a bowl and cover with boiling water. Plunge cucumber slices into cold water and drain. Place drained cucumbers in fridge for 30 minutes. In a small bowl combine Sour Cream, Salt, Sugar, Ground Pepper & chopped Chives. 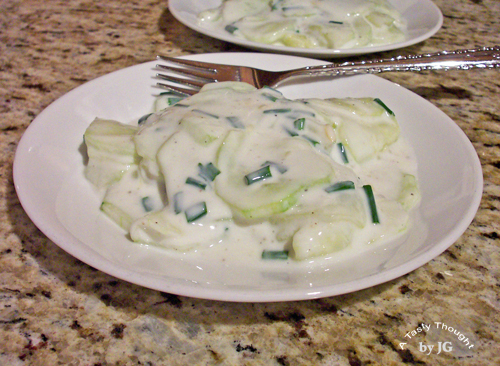 Before serving combine dressing with cucumber slices. This week we will enjoy it again. Three or four Cherry or Grape Tomatoes will be added on top. Fresh local tomatoes are also abundant and taste delicious! Summer is great! 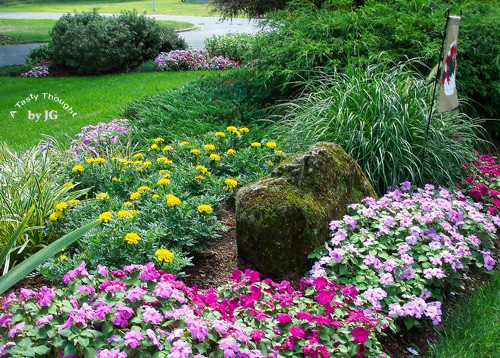 There is so much color in our gardens. In our front cut-out perennials and annuals flow together. Overnight there can be a change as blossoms appear. 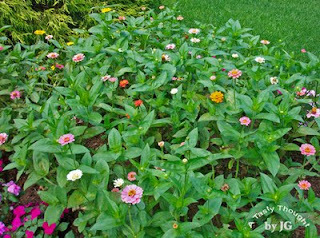 This just may be the last season of our current Zinnias. Every summer I save seeds from the current year's gorgeous blossoms. After drying the seeds and storing them during the winter they are planted in the spring. 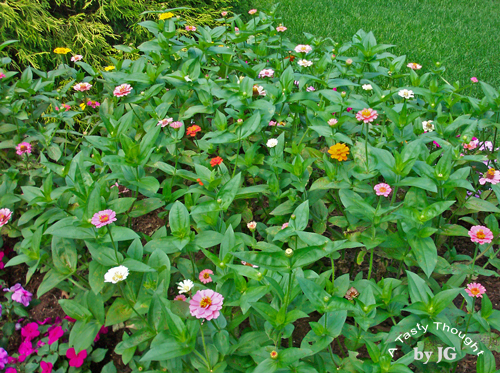 It was a little "iffy" as to how the Zinnias would fare this year, because this is the fourth year that seeds were saved and planted from the original purchased seeds. But all is well! More buds are ready to blossom. One hot afternoon this week we had a craving for Grilled Sockeye Salmon. Well, a reasonably priced nice piece of "wild caught" Sockeye Salmon was not in the cards. Breaded Sauteed Chicken Tenderloins quickly found their place on our dinner table that evening. Now, there were quite a few extra pieces of tenderloins after dinner. Needless to say, into the fridge they went. At this time of year there usually is a large green Pepper visible every time I open our fridge's door. 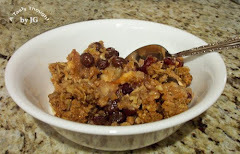 The ingredients for another quick & easy colorful delicious dinner were at hand! WooHoo! Wash Green Pepper. Cut into strips. Saute in Olive Oil in skillet about 4-5 Minutes. Add drained Plum Tomatoes that have been cut in half. Cut cooked Chicken Tenderloins into pieces and add to skillet. Sprinkle 1/8 teaspoon Oregano, Sweet Basil & Garlic Powder over ingredients in skillet. Heat about 6-8 Minutes, until hot. Stir occasionally. The Chicken Tenderloins I used had been coated with Bread Crumbs and sauteed. 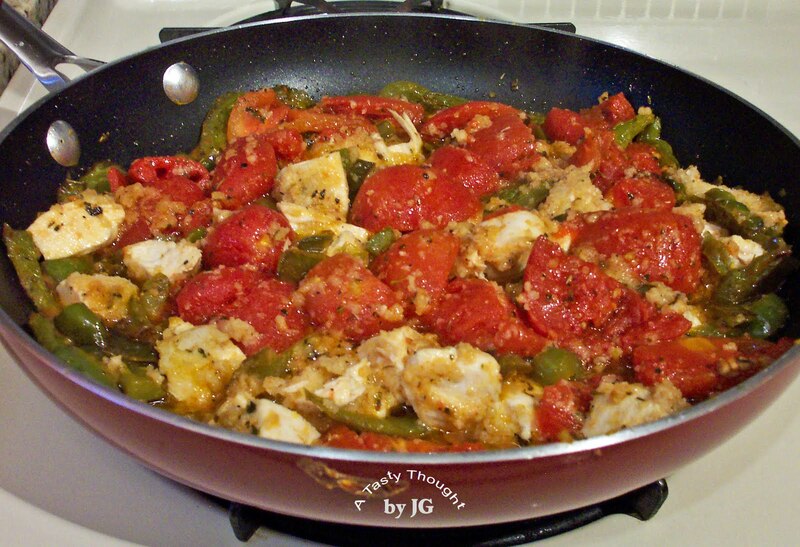 As the juicy Plum Tomatoes heated, the Bread Crumbs on the Chicken pieces absorbed the juice. Dinner was so yummy!